Construction is just about to commence on a concentrated solar power (CSP) plant in Morocco, marking the first stage of a huge $500-billion renewable energy network set to supply power to North Africa, the Middle East, and Europe. 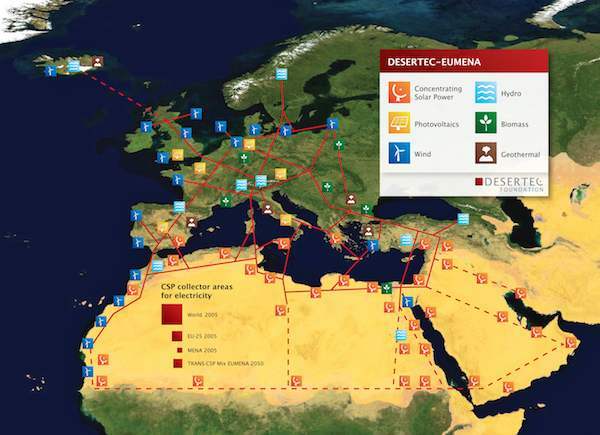 For those of you unaware, this massive energy network is called Desertec, and will potentially lead to the construction of a vast array of solar plants and wind farms across deserts in North Africa and the Middle East. Upon completion, the project is projected to provide Europe with 15% of its electricity needs in 2050 – a continent with serious plans for renewable power in the coming decades. However, Desertec will also be particularly helpful in supplying clean power to North Africa – a region dominated by fossil fuel use despite its access to a plentiful supply of solar energy resources. Although the project is ambitious, and its magnitude has attracted a great deal of skepticism, it is backed by some major global players, including Munich Re, Enel, Abengoa Solar, Deutsche Bank, and a dozen other companies and institutions. Germany is also a major proponent of the project, as it seeks to phase out nuclear plants in lieu of renewable energy sources such as wind and solar. And just on a practical note, it seems to make sense to build a giant network of wind and solar plants in the middle of the desert – after all, the world’s deserts receive enough solar energy in 6 hours to power the whole world for a year. The first phase of the 500 megawatt Desertec renewable energy network will be a 150 megawatt CSP facility in Morocco. The 12 square-kilometer facility will take 2 – 4 years to complete and cost a total of $822 million.